Book Now: £795 £425 + VAT Book by 13th May and Save £370! 5 experts. will be speaking. Starts at 8:00 AM. Take your Android development skills to new levels at droidcon London 2019, the biggest Android developer conference in Europe. droidcon London will be back in 2019 after its 10th Birthday Celebrations! Last year, developers from around the world gathered to listen to a range of keynote speakers, grow their skills, connect with other passionate Android developers and celebrate droidcon London's 10th Anniversary! This year, we'll present once again two days packed with highly-technical talks from over 70 expert speakers. Our droidcon London icons Chet Haase and Romain Guy will be back and we are also very excited to announce that Stacy Devino and Christina Lee will join us with a Keynote talk! Be inspired - leave with practical ideas you can implement straight away. Develop connections - network with other Android developers. Explore London - our central location puts this world-class city within your reach. Would you like to speak at droidcon London 2019? We want to hear your talk proposals! Talks will be selected by Skills Matter and the Programme Committee on the basis of making the conference a varied, diverse and valuable event. Deadline for submission is COB Thursday 30th May 2019. Christina is a Software Engineer and Android GDE at Pinterest, where she works on the Core UI platform team. We look forward to welcoming back Jake Wharton to droidcon London 2019! Android Framework engineer at Google working on Kotlin things. Has a long-time severe allergy to boilerplate code and for years has been raising awareness on the issue as well as leading efforts to eradicate this horrible disease that plagues modern developers. Keynote: Extremely excited to have Stacy Devino at droidcon London 2019! Stacy is a Google Developer Expert for Android, Intel Innovator, Google Developer Group Mentor, and WTM Lead. She has worked on Android Applications down to the whole Android OS and even developed IoT appliances from the ground up which are in use by companies like Apple and Amazon and has work featured on Wired, Gizmodo, and Geek.com. Apps she has built have tens of millions of active users and developed cloud solutions at scale. She currently works for Nike s23NYC Labs doing Android apps like the SNKRS app, Augmented Reality, Machine Learning, and touch of InfoSec focused on delivering exceptional customer mobile experiences. Our icons Chet Haase and Romain Guy will be back to droidcon London 2019! Romain Guy is the Android Graphics Team Manager. Situated in Islington, one of London’s most vibrant areas, the BDC is within walking distance of Angel tube station and relatively close to Kings Cross, Farringdon, Liverpool Street and Euston stations. 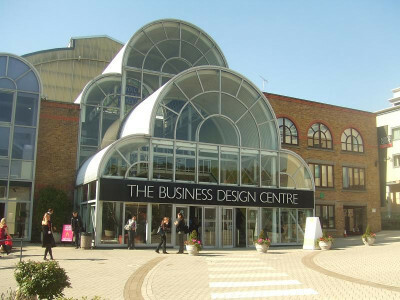 Conveniently located outside the congestion charge zone, the venue also benefits from on-site car parking, an adjacent Hilton Hotel, and has disabled access. Would you like to help us facilitate a great conference? Help us set up the conference spaces, introduce talks and speakers, field Q&A questions with mics, or support some of the workshops and hacks we've got in store? Email us at conferences@skillsmatter.com and we will put your name down as a volunteer for droidcon London 2019! Shifts and detailed info will be confirmed closer to the conference. Skills Matter is proud and happy to share once again our droidcon London Diversity Scholarship Plan, which provides support to those from traditionally underrepresented and/or marginalized groups in the technology and/or open source communities who may not have the opportunity to attend droidcon London for various reasons. Applicants should be from a traditionally underrepresented and/or marginalised group in the technology and/or open source communities and would be unable to attend without some assistance. Call or email our team about the droicon Fringe Package for a special discount on bundle tickets! Want to learn to build beautiful Flutter apps that users can navigate through easily, fetching data along the way? Join this two-day hands-on workshop with Brian Egan! Mobile development is a difficult task these days. Not only do you need to write beautiful, high performance apps that work on low-powered devices with intermittent connectivity, you need to write your apps twice! Once for iOS and again for Android. Google's new UI framework allows you to develop high quality apps for both operating systems using a single code base. Learn to speed up your mobile development and ship to both platforms with this fun framework! Are you passionate about clean code and want to learn how to implement advanced architectures in Android applications? Join Jorge Ortiz Fuentes for this three-day course and follow an iterative and constructive path to build the greatest and most complex applications while keeping your code reusable, maintainable, testable, and decoupled. This is a hands-on workshop, where you will write code in your platform, using a trusted codebase and with support and guidance from the instructor. Students will have access to a Git code repository so that they can flexibly review parts of the course as they learn. Would you love to take full advantage of Java without its verbosity? Wish there was a better way to avoid NullPointerExceptions? Want to be able to still rely on first-class tooling and industry support? If so, then this workshop will show that is now possible. In this workshop David Denton and Ivan Sanchez will show you the language's powerful, developer-friendly features, how they relate to what you know already, and to safely and incrementally migrate them existing Java codebases to Kotlin. Whether you are seeking to improve visibility of your tools, devices or projects, or simply would like to support the droidcon's passionate community through your engagement, our sponsorship team will be able to help you select the best sponsorship package for you! Email sponsors@skillsmatter.com or phone 0207 183 9040. We hope droidcon London 2018 will inspire you with lots of new ideas. Take your Android development skills to new levels at droidcon London 2018, the biggest Android developer conference in Europe. Now in its 10th year. droidcon2gether 2017 Workshop: Get hands on with Android Things! We hope droidcon London 2017 will inspire you with lots of new ideas. Want to meet the international Android community, listen to expert speakers, find out about all the latest Android advances and see fantastic new technologies? Then join us at droidcon London, the largest Android developer conference in Europe! We hope droidcon London 2016 will inspire you with lots of new ideas. If you fancy getting stuck in straight away, join fellow droidcon attendees and some of the most talented coders and experts, for the traditional, weekend-long DroidconHack and create something amazing! We hope Droidcon London 2015 will inspire you with lots of new ideas. If you fancy getting stuck in straight away, join fellow Droidcon attendees and some of the most talented coders and experts, for the traditional, weekend-long DroidconHack and create something amazing! This October the international Android community, gathered for a great 2 days to listen to expert speakers, find out about all the latest Android advances and discover new technologies. Novoda and Skills Matter would like to offer you a very warm welcome to the 6th Droidcon London Hackathon…two days, one night, 100s of of bacon sandwiches (or veggie option! ), litres of coffee and beer, not to mention the very latest SDKs, software and thinking in the Androidsphere. Join fellow Droidcon attendees for this exciting hackathon and workshop weekend, where you can make new partnerships, deep-dive into Gradle with Hans Dockter or ROM cooking with GenyMobile, create something new (and maybe win a prize! ), and have a lot of fun in the process! Droidcon London 2013 was held on October 24-25th in the Business Design Centre in Islington, where hundreds of people enjoyed two days of pure Android with big speakers like Hans Dockter, Eric Lafortune, Ty Smith, Taylor Ling and the rest of the Android community! Droidcon London 2012 was another jam-packed two day conference! Skills Matter and WIP are pleased to announce Droidcon London 2011, which will take place in London on 6th - 7th October 2011 -- featuring the cream of the Android developer world. Skills Matter is pleased to support droidcon London 2009 taking place in London on 2nd December - the UK's first community event aimed at grassroots Android developers!